Oh My Gore : "Hello. Could you please present yourself to the Oh My Gore ! readers who might not know about you yet ?" I'm Uwe Boll born June 22 1965 in Germany. I directed "HOUSE OF THE DEAD" and "ALONE IN THE DARK". 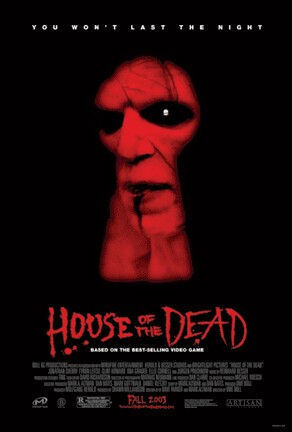 Oh My Gore : ""HOUSE OF THE DEAD" is the adaptation of the video game of the same name, but, unlike the others adaptations, we can see video game footage in your movie. Can you tell us more about this ?" We used mini clips - always less then a second to jump from scene to scene and as a hommage to the videogame. Oh My Gore : "According to you, why do you think that we can see so many video game adaption these last few years ?" Videogames are the bestsellers of the young generation, more interesting as books. Oh My Gore : "The fans of this kind of video games are purists, aren't you a bit scared of the critics from them ? Do you think"HOUSE OF THE DEAD" will correspond to what they're wainting for ?" Our movie is a very fast , bloody, gory action horror - ego shooter tour de force. Like the game. Don't expect great characters or dialog, don't expect a teenager slasher film, expect a ZOMBIE WAR. Oh My Gore : "I think the comparison with "RESIDENT EVIL" is inevitable, what do you think about this movie ? What did it miss according to you ? Do you think "HOUSE OF THE DEAD" will be different and why ?" I think we have more gore in "HOUSE OF THE DEAD", more action, we have fast attacking zombies like in "28 DAYS LATER" and like in the game. "RESIDENT EVIL" was good - but not gory. Oh My Gore : "You'll make "ALONE IN THE DARK" too next year, and I think that "HOUSE OF THE DEAD 2" is scheduled too, aren't you afraid of being trapped in this genre ?" No - I like the genre and it is not ONE GENRE - because also videogames have different genres. I just got "BLOODRAYNE" - and I wanna move it into a "SLEEPY HOLLOW" story. Oh My Gore : "The movie is scheduled for october 10th, but was already shown in San Francisco and L.A.. Were you pleased with public relation ?" Everybody enjoyed it, nobody left the screenings. Some people like it - other people don't. Oh My Gore : "Can you tell us more about shooting of the movie, the general mood ? How was it to shoot with some people like Clint Howard ("THE ICE CREAM MAN") or Ellie Cornell ("HALLOWEEN 4" & "HALLOWEEN 5") ?" The actors were all great and the movie was a lot of fun to do. I like doing action scenes and we did it. Big battles with tons of bloodeffects and dead bodies. Oh My Gore : "Did the developping team of the game work with you ? If so, can you tell us about this ?" SEGA guys played zombies and made pr. ATARI is doing much more on "ALONE IN THE DARK". Oh My Gore : "Let's talk about your movie tastes now, and to stay in the zombie genre, are you more into Fulci or Romero ?" Oh My Gore : "Which movie of the Romero trilogy did you prefer and why ?" "DAWN OF THE DEAD". It was the scariest one. Oh My Gore : "Which horror movie struck you the most ?" Oh My Gore : "About your future projects, everybody always quotes "ALONE IN THE DARK" and "HOUSE OF THE DEAD 2", anything else scheduled ?" Oh My Gore : "What do you think about Oh My Gore ?" Oh My Gore : "Thank you for this interview, anything else you would like to say ?" 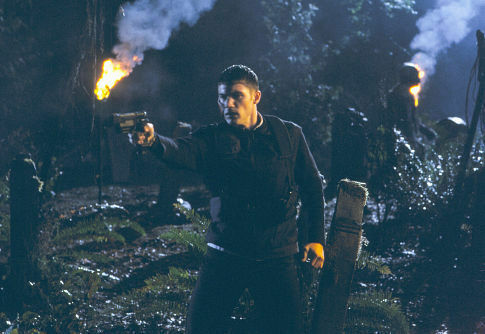 "HOUSE OF THE DEAD" started yesterday very good in the US theatres. This page has been seen 3574 times.